Comments are set so that anyone should be able to enter one. Please enter your "solution" and comments in there. I will post the answer there after a week. 1... Rxh3+ (wins a pawn, but wait - there is more!) 2. Kg1 Qd4+ (or Qc5+) 3. Qf2 Rh1+! 4. 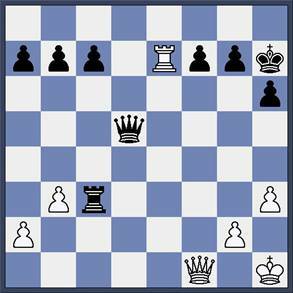 Kxh1 Qxf2 winning the queen for a rook.